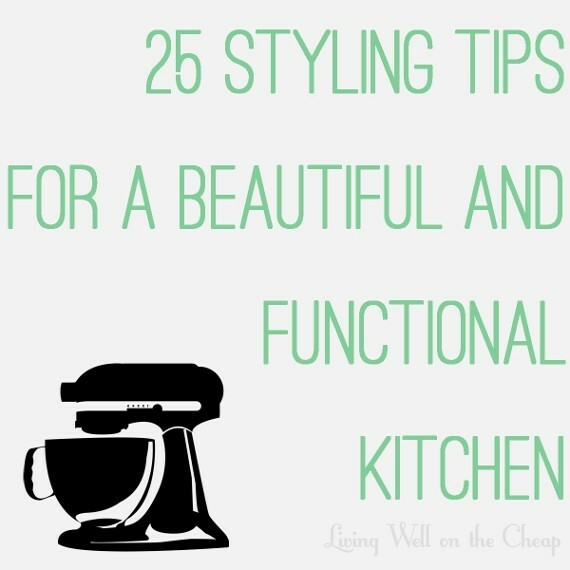 Yesterday I posted 25 Styling Tips for a Beautiful and Functional Kitchen and today I’m back to share how I’ve applied some of these tips in my own home. I don’t have many of the high end appliances and features that you see in magazines, but I do have a space that makes me happy and because I’ve set it up thoughtfully it’s very easy to work in. 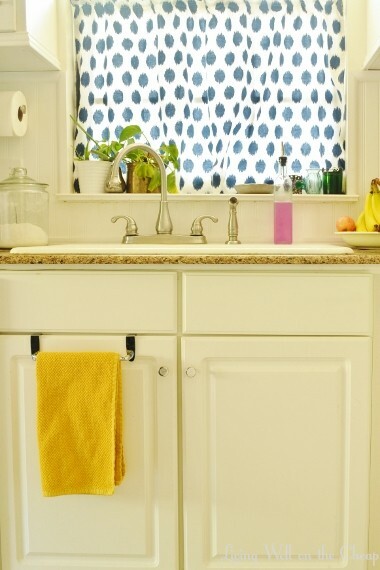 My dishwasher detergent is in a glass canister, my dish soap is in a cruet meant for olive oil, a bar of hand soap is in a dish on the windowsill, and an absorbent towel in a favorite color hangs from an inexpensive holder on the cabinet below. I’ve got a small collection of bud vases on display (handy for any pretty flowers I may collect outside), a couple of plants, and a metallic pear I got ages ago for a few bucks. 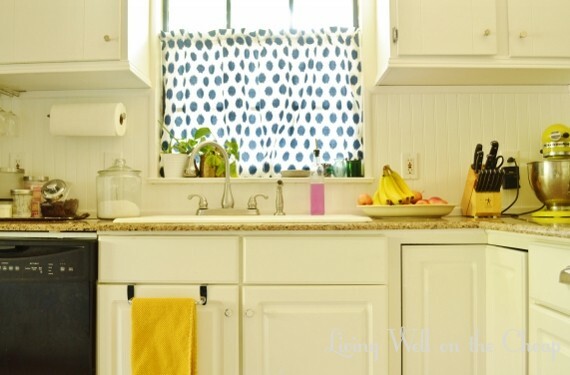 The curtain adds fun color and pattern to a largely neutral space. I use the peninsula immediately adjacent to this area for food prep so the corner is prime real estate. I keep apples and bananas out in a platter (though the fruit flies are killing me lately!). Next to that sits a knife block and stand mixer. All of my baking supplies and mixer accessories are stored in the cabinet above. 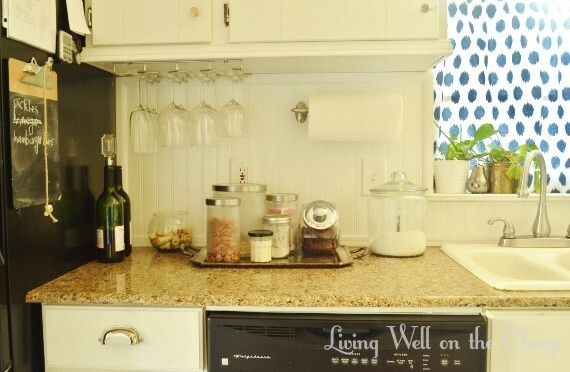 Over here I’ve got a memo board, stemware, and paper towels taking advantage of vertical space and on the counter a pretty silver tray groups raisins, almonds, tea, sugar, oatmeal, and a pretty candle. I keep a glass bowl out to collect corks and a couple of handy supplies like a corkscrew, bottle opener, matches, and more tea are in the drawer below. 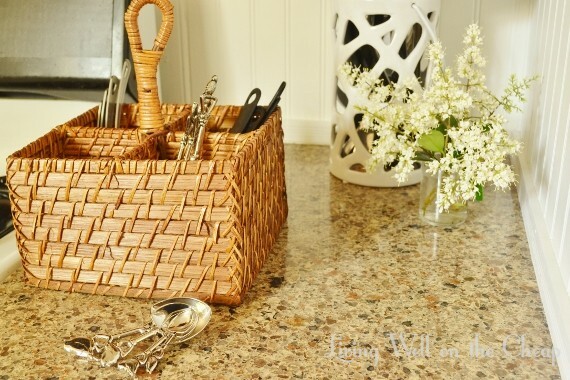 Grouping these items together on a tray helps it look less cluttered and adds a decorative element as well. I love love love vintage silver, but the same effect could be achieved with a shallow basket or any kind of tray that suits your fancy. The eye prefers odd numbers and symmetry but careful disregard for these rules can be fun. Make a list of your favorite colors and textures and find ways to work them in. You don’t need to spend hundreds of dollars at Anthro, Pottery Barn, or even Target. Most of what you see in these photos has either been collected over the years from various secondhand sources or picked up inexpensively at closeout stores like Marshall’s or Stein Mart (sadly we have no HomeGoods here, but that’s a good option as well). 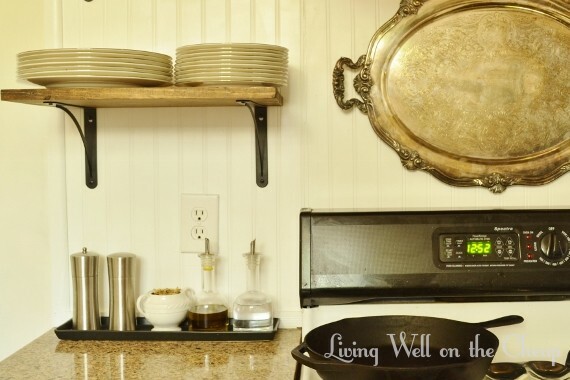 I know that my kitchen would look so much better with a new stove, but I’m not letting the ugliness of the old one stop me from decorating around it. You’ve got to work with what you’ve got! The narrow black tray came from Ikea several years ago and I think is intended for candles but it’s perfect for keeping some things handy near the stove. The four taller items looked weird by themselves so I added a vintage sugar bowl with a small preserved plant inside (that’s what I like to call plants that I’ve killed but that still look okay). The bowl serves no functional purpose here but it made the grouping odd-numbered and thus instantly improved the aesthetics. My cast iron skillet stays out all the time, mostly because it’s so freaking heavy. The silver platter was gifted to Nick’s great-grandfather upon his retirement from the jewelry store where he worked for 65 years. This side of the stove has been switched up a few times as I try to figure out what works best. I used to have all of my measuring cups and spoons in a plastic bin in the pantry but I started getting annoyed that the bin was in the way of the food. I just got this woven flatware caddy and it’s perfect for hiding these things in plain sight. I looked for a pretty glass measuring cup for liquids but couldn’t find one that I liked enough to leave sitting out, so the ugly plastic one I’ve had for years has been relocated to a cabinet near the sink. I was surprised to find that that’s actually a much more convenient home for it! All of my cooking utensils are gathered in a cylindrical container on the counter–it’s intended to be a lantern for candles but, you know, whatever. This move freed up the drawer below to store potholders and trivets. My mother in law gave me these sweet measuring cups and spoons with birds on the handles for my birthday. I love seeing the little birdies peeking out from the top of the basket. Also, most of us can’t afford to buy fresh flowers all the time but clippings from the great outdoors can be just as pretty. These buds feel fancy despite that fact that they were 100% free and are sitting in a shot glass. This is not the kind of thing that I’d suggest doing all at once. Take some time to think about how you use your kitchen. What do you need stored where? What would be best kept behind closed doors and what would be better kept in plain view? And what is taking up space that you don’t really need? 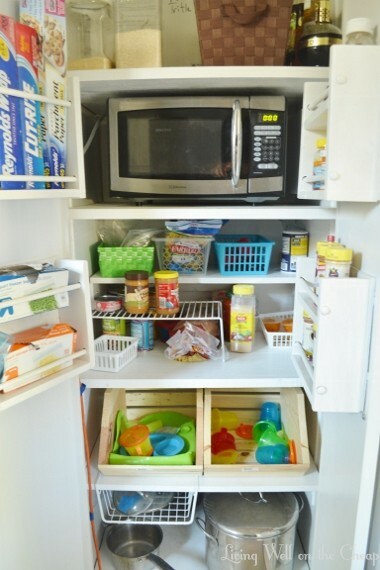 Then find creative ways to make it work and keep your eyes peeled for items that can serve as attractive storage containers or decor. You might be surprised by how many beautiful things you already have! Kitchens in magazines always look so beautiful, but when you look closely it’s clear that things are only styled that way for the camera. Eggs displayed in a bowl on the counter, lemons being sliced on a wood cutting board, fresh flowers near the sink, bottles of perrier, etc.. These photos may be inspirational but they are not practical. It’s like the home decor version of photoshopping models and leaves many readers thinking that their own kitchens can never measure up. As I gather motivation and money to tackle some of the less glamorous tasks that I’ve put off to the end of updating my kitchen, I’ve been working on making the everyday experience of living and working in it more pleasurable. This means having what I need where I need it as much as it means being easy on the eyes. At first I didn’t even know what search terms to use on google and pinterest to get ideas for how to arrange things. I just scanned through pictures of kitchens looking for good ideas. I remembered soon enough that this particular aspect of decorating is called styling–it’s the finishing touches, the small details, but it can make a big difference in the way you use your kitchen every day if done well. 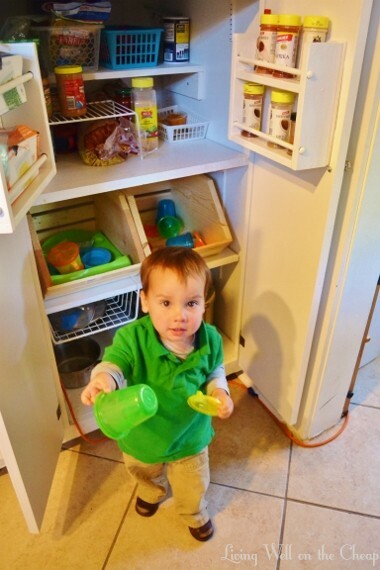 Something as simple as pulling some frequently used items out of the pantry and placing them in canisters on the counter can feel like the height of luxury when you’re not having to reach into the pantry once again just to hand your kid a couple of raisins. When it comes down to it, functional styling is all about determining what you use most often and finding a way to keep it close at hand in a way that’s aesthetically pleasing. Think about what you need and then find ways to either make those things beautiful or store them conveniently.Put ugly things away, keep pretty things out, look for more beautiful versions of everyday items, and get rid of what you don’t need or love. 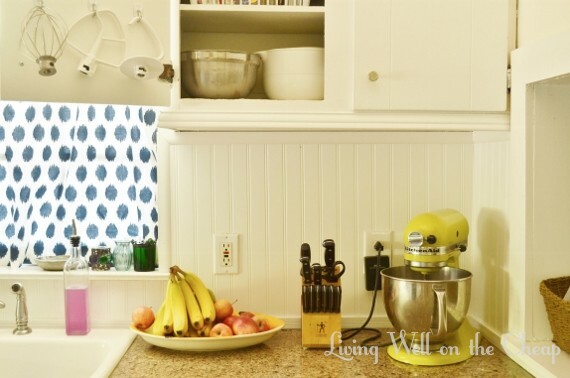 Attractive small appliances, like a stand mixer or an especially attractive toaster or coffee machine (we are not coffee drinkers so our $10 coffeemaker stays in a cabinet and comes out only when guests are staying overnight). 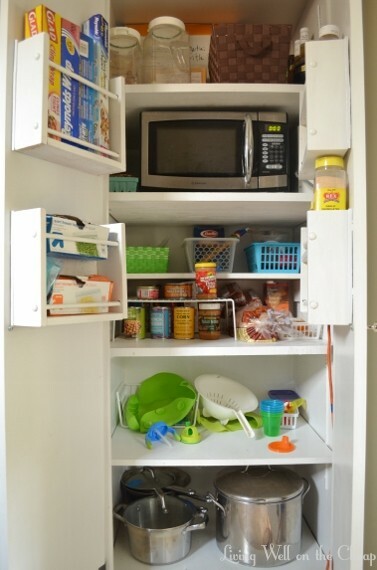 Find ways to store accessories close at hand, like using hooks to hold mixer attachments in a nearby cabinet. If having a toaster or coffeemaker out is important to you keep your eyes peeled for one that you don’t mind seeing every morning. There are tons of ideas on Pinterest for setting up a nice looking coffee station. Plants, especially herbs or aloe but really whatever you can manage to keep alive. Succulents are easiest. Relegate all of your ratty old dishtowels to dirty jobs and treat yourself to a couple of new ones that you won’t mind keeping out in the open. Look for some that are absorbent so you won’t be cursing them every time you dry your hands. There was a towel rack installed across the room when we moved in but it was impractical so I was excited to find a pretty over-the-cabinet one for $5 at Marshall’s. Put salt, pepper, olive oil, vinegar, and anything else that you use frequently in attractive and easy-to-use containers near the stove. 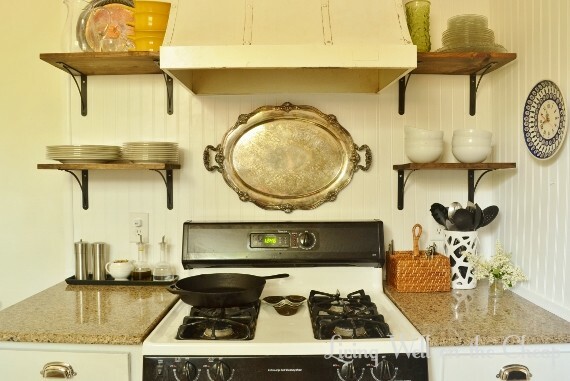 If you have a favorite pot or pan don’t be afraid to store it on the stovetop. My cast iron skillet stays out all the time. Same goes for cute teakettles or whatever else you use and love. 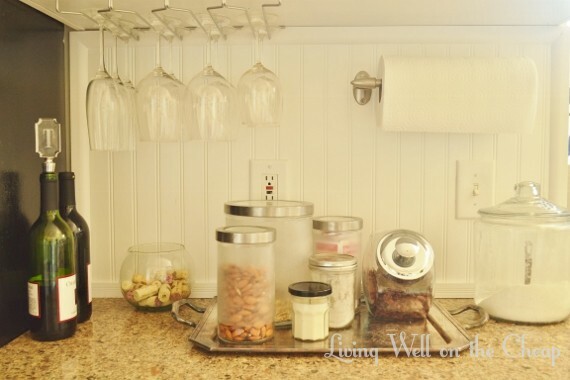 Store measuring cups and spoons in a basket or flatware caddy that can be moved to wherever you need it. This way you can always have it close at hand whether you’re adding ingredients to a pan on the stove or working in a separate food prep area. Display fresh flowers or clippings from outside–even just leaves can be pretty! Cookbooks. I don’t really use them but some people go gaga for them. If you have a collection consider displaying them in the open. Consider downsizing your collection of appliances. The old fashioned versions of many kitchen tools are easier to store. Do you really need an electric can opener, wine bottle opener, or sandwich press? Of course if you love having these things then keep them! But if they’re in your way or you find it annoying that you can’t open a can of beans or bottle of wine during a power outage then maybe think about downgrading to a version that can be stashed in a drawer and operates on elbow grease. And here’s a bonus tip since it may not apply for everyone, but I moved my microwave into the pantry and it was a total lifechanger. I’m saving up to hire an electrician to install an outlet in there. It’s about more than just looking pretty–it’s about efficiency and order and making your life easier. 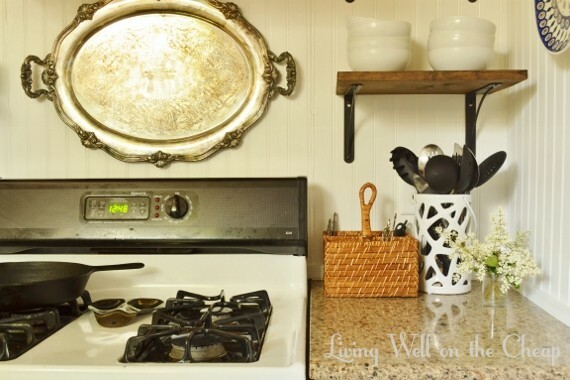 This process of arranging everything just so has made such a huge difference in the way I feel about my kitchen. I used to think it was so cluttered and inefficient, but now I’ve got what I need where I need it and it looks so pretty that I feel a little bit fabulous even if I’m just fixing a cup of tea. I’ll be back tomorrow with some photos showing how I’ve applied these ideas in my own space. Thanks for reading, y’all, and I hope y’all had a great weekend!